Results of laboratory and shop tests of the process of manufacturing cylinder block castings from vermicular graphite iron for an augmented tractor diesel engine are presented. Possibility of consistent mass production of vermicular graphite iron by the method of ladle treatment with "chips inoculant" under the conditions of the Minsk Tractor Plant's foundry is shown. The basic principles of designing gating-and-feeding systems with improved hydrodynamic characteristics for the production of gray iron castings on a "Disamatic" molding line are given. The possibility of a significant reduction of casting rejects and defectiveness is shown. Recommendations on using in-mold melt filtration are given. Results of thermodynamic calculations of the temperature of the start of recovery of a number of alloying elements owing to solid carbon are presented. Possibility of efficient copper and nickel recovery during heating of the charge in a melting furnace, containing oxides of alloying components is shown. Laboratory and shop tests of the process of melting liner cast iron in crucible induction furnaces using copper- and nickel-containing waste have been conducted. It has been established that the degree of alloying elements recovery is over 80%. Analysis of effect of sulfur and sulfur-containing compounds additions on the shape of the iron-containing phase, electrical and mechanical properties of aluminum alloys has been conducted. Expediency of using sulfur-containing compounds as refining-and-inoculating additions to aluminum-based melts has been shown. A number of nontoxic highly effective preparations for the complex refining-and-inoculating treatment of aluminum melts have been noted. 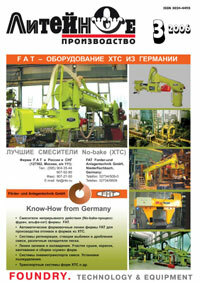 The article discusses the problems of lubricating die casting dies. Lubricating properties of individual organic and inorganic components have been investigated. It is shown that a new complex component has higher lubricating properties and can be used in the composition of water-emulsion lubricants. Dependency of shrinkage porosity in Al-Si alloys on the silicon content, casting method and type of the used aluminum-strontium master alloy has been studied. It has been shown that the main cause of shrinkage formation in inoculated silumins is the change of the alloy crystallization character from consecutive to volume-consecutive. Recommendations on the production of dense castings from inoculated silumins are given. The modification of the eutectic structure in aluminum-silicon-magnesium alloys related to the thermal analysis parameters was investigated. The magnitude of the eutectic under cooling and eutectic arrest depression caused by a modifying sodium and strontium has been correlated to the eutectic microstructure accordingly to type of modifier. The reason for difference of cooling curves and microstructure of aluminum-silicon-magnesium alloys modified sodium and strontium is change in growth mode of eutectic crystals from the liquid. Results of analyzing the occupational morbidity of foundrymen are given, and the influence of the working conditions factors on the safety indices in foundries is shown. Conclusions have been made, and methods of improving the working conditions in foundries have been worked out. Investigation into the process of crystallization of primary chromium carbides has shown that the primary crystallization of hypereutectic high-chromium cast iron is a multi-stage process consisting of cluster-type nucleation, nuclei's diffusion growth, and then also intercrystal growth due to attachment of fine and finest crystals to larger ones. Diffusion deoxidation of steels with a high-dispersion mixture of powders of carbon- and silicon-containing materials, developed at the Smolensk Regional Department of the Russian Foundry Association, has been mastered. The mixture is explosion-proof, allows a fuller slag deoxidation, and an effective metal refining. Its use resulted in better mechanical properties of steel (especially impact toughness) and better economic working conditions.